The Young and the Restless (Y&R) spoilers tease that the Abbotts will take a firm stand against Graham (Max Shippee). When Graham continues to make trouble for Dina (Marla Adams) her family, Jack (Peter Bergman) will decide enough is enough. He’ll deliver a vicious threat, but Graham probably won’t back down. He seems to think he’s in charge, but that may not be the case for long. Y&R spoilers state that things could get interesting after Dina makes a shocking move. She’ll do something crazy around Halloween, so it’s very possible that Dina will kill Graham. She may snap and determine that she just can’t take it anymore. Dina might feel like it’s the only way the Abbotts can have peace. Of course, that would bring up a whole new set of problems. For starters, a cover-up might be necessary. Could Victor (Eric Braeden) be of service? He’s a master when it comes to stuff like that. Sweeping a murder under the rug is a piece of cake for the great Victor Newman. However, that doesn’t mean this issue would go away entirely. Myrna (Marcia Rodd) will wonder what’s up if Graham suddenly goes missing. Likewise, Y&R suspiciously chose to make Brent Davis a stepfather to Graham. That leaves the door open for Graham’s biological father to emerge at some point. 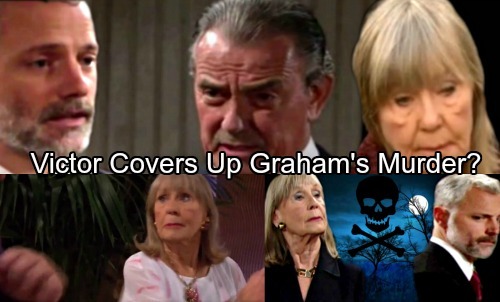 The Young and the Restless spoilers hint that we’ll learn much more about Graham soon. Will that be before or after he bites the dust? Will Graham’s parents be out for revenge? Regardless, major drama is brewing. Dina may be her own worst enemy if she can’t handle the pressure. Jack, Ashley (Eileen Davidson), Traci (Beth Maitland) and Abby (Melissa Ordway) will certainly be concerned as Dina struggles. She may be on the verge of a total breakdown! If a fragile Dina blurts out a confession, she could go on trial for murder. Could Jack let it get that far or could he try to take the blame? Despite the hostility they faced in the past, Jack and Dina have a real connection. Their bond could grow much stronger once the horrific events of November sweeps play out. 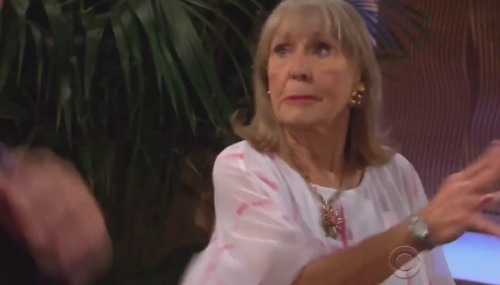 The Young and the Restless spoilers say Dina is certainly going to need her loved ones on her side! Are you excited to see the rest of this hot plot? We’ll give you updates as other Y&R news comes in. Stay tuned to the CBS soap and don’t forget to check CDL often for the latest Young and the Restless spoilers, updates and news.